Well, actually, I love coffee once I have added enough sugar and cream (real cream, NOT non-dairy cream substitute) to turn the nasty, bitter, black liquid into something that actually tastes as good as it smells. I did not drink coffee until I reached my mid-thirties, when a good friend lured me to Starbucks and bought me a White Chocolate Mocha latte’ (cappuccino? I still don’t know which is which…) and I discovered that you can make almost anything palatable if you add enough cream and sugar to it. After spending more money than I ever should have at the local Starbucks shop, I broke down and bought a small coffee pot that made just enough coffee to fill the insulated travel mug that came with it. That was sufficient for a number of months, but, we all know how addictions progress. The same friend who took me to Starbucks (Thanks, Joy!) later gave me a French press that made very nice, smooth coffee in larger quantities than my little travel mug set-up. After that came the 4-cup coffee pot, which is really misnamed because it only filled my coffee mug twice. Four cups, indeed. Then came the 8-cup coffee pot, you know, in case I had friends over who wanted coffee. When Mother moved in with me, I started making a 6-cup pot of coffee every morning, but sometimes when I went back for seconds, I would find the pot empty. This meant I had to start preparing an 8-cup pot of coffee every morning, just in case we both needed extra on any given day. Now, over ten years after that first Starbucks experience, I have graduated to the 12-cup monster shown above. 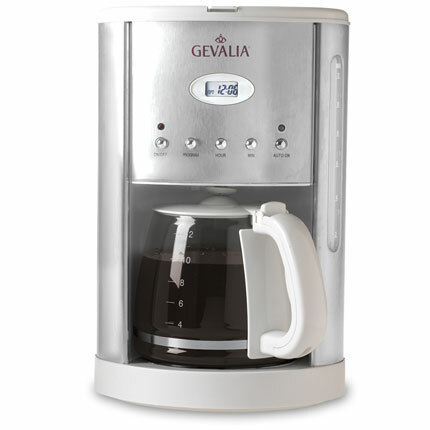 (I got it free from Gevalia by signing up for their coffee subscription service, after I forgot to turn the coffee pot off one day, and Steve found it 15 hours later, when he smelled something roasting at the other end of the house.) The spiffy new black-and-stainless pot has a clock/timer that allows me to set it to come on at a certain time, but more importantly, allows the coffee pot to turn itself off after two hours. Now I don’t have to worry about burning the house down with Mother in it. Mother is drinking less coffee these days, so I’m back to brewing six cups every morning, an amount she and I split approximately 70/30. She has her coffee with a little cream in a regular coffee cup. 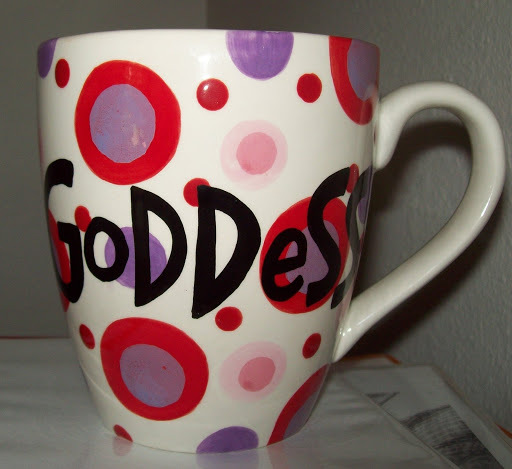 I have my coffee with a lot of sugar and cream in a large mug (my favorite shown above – thank you, Sweetheart!). Sometimes in the afternoon, I will finish off the morning’s pot by making a nice, creamy iced coffee to drink on the way to work, as long as I don’t intend on trying to sleep before 2 a.m.